I am very jealous of this. Amazon Japan is selling a special edition of Godzilla on Blu-Ray that not only comes in some lovely steelbook packaging, but with this spectacular red Godzilla figure. That's one hot Kaiju right there. The figure is a repaint of Tamashii Nations' gloriously articulated 2014 Godzilla from their S.H Monsterarts collection, painted to match the fire-y red background included in the special edition - similar to the posters for the movie, but even redder. Honestly, Godzilla just looks kind of awesome when he's burning hot red. 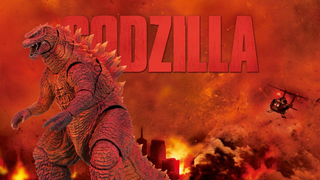 The collectors edition also includes 2D and 3D copies of the film on Blu-Ray, as well as a 2D version on DVD, as well as a Steelbook case and a special Blu-Ray featuring extras looking back at 60 years of Godzilla goodness. The set will be out February 25th in Japan, and will set you back ￥ 16,200, or around $142. Hopefully this version of everyone's favourite Kaiju doesn't stay exclusive for long, and I can find away to get my grubby mitts on him.